It’s been a while since my last update, so I though I would post a short follow up of the last few months and share some of the final images from the virtual experience. I added a few additional details, such as the ceiling vultures soaring towards the sanctuary. 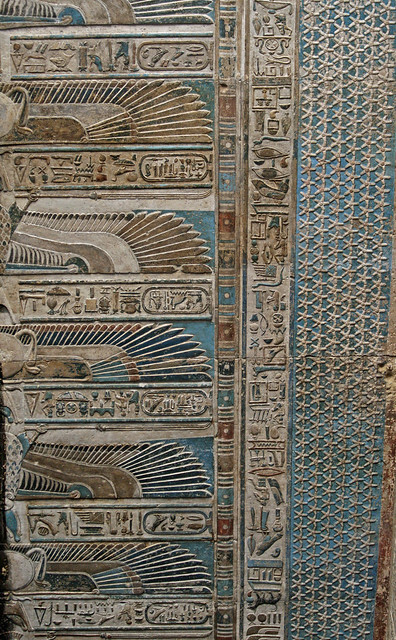 Beginning with the ceiling piece photographed by the Ranke expedition, I filled in the missing information by referencing the ceiling at Dendera Temple 7. The transition from my home computer to the machine in the lab didn’t go quite as smoothly as I had hoped. I was using a Nvidia GTX 1080ti which flew with the graphics. However, when I began testing in the lab I realized the hardware, an Alienware equipped with a GTX 960, was causing frame drops in various areas. To fix this I had to reduce the overall poly count of the scene (primarily from the surrounding vegetation). Bellow are a few images from the final version of the temple and surrounding environment. Having a larger space to walk within was definitely beneficial. Teleporting posed a few challenges to those trying the Vive for the first time. I found that people were trigger happy with the teleporter, as a result they kept hopping to the roof (they seemed a little distressed when I mentioned they would have to through themselves off get back to the ground level). Accidental travel to the roof has become so common that I might remove the navMesh from upper level entirely. The green area is the navMesh that a viewer is able to teleport within. Showing off the temple at the Ryerson Poster. Photo by Michael Carter. Stumbled on your project. Think it’s brilliant. Really neat to see the process from beginning to end. I was curious is there a finalized walk through available on youtube or the like? Thanks for the positive response. I don’t have a recorded walk through yet. I’m actually going to be updating the textures over the next several months. Unreal Engine’s lighting is a little limited, so I plan on baking the lighting into the maps using Vray in Maya. I think this will add more natural subtlety to the experience. I’ll post the process when I get a little further along.